You can read this small one-page article right here. Great job adding the comparisons! What about 3440x1440? Is it supported? About DLSS, it's not just blurry, it's just has much less details, so of-course the FPS gonna improve, looks like on simple surfaces DLSS can do OK, but on very complicated objects/textured DLSS can't be useful, the affect is just too bad, SRY NV fans :-(. For what it is I'm surprisingly impressed. Better article then the previous one. I have an aw3418dw and msi 2080 gaming x trio. It works on 3440x1440, but the image qualitiy loss doesnt worth it. I do prefer play with dlss+rtx off. @Hilbert Hagedoorn : Can we get screenshot with DLSS-ON and "resolution scale" high enough to decrease fps to match DLSS-OFF screenshot? Side note, not allowing DLSS on 4K for weaker cards is like saying: "Pay Extra!" Limiting DLSS on different cards per resolution is intentional and disgusting. I agree with Fox, it is like saying pay more. After such a heavily marketed feature at the end is another useless one. How would Thanos looked like if he was Renderd with DLSS ON ? I think I expressed accurately the DLSS effect on quality- am I right? DLSS turns him from intimidating and angry into elderly man with expression showing trouble to understand something in front of him. It is absolutely illogical why i can't use dlss on 1440p on my 2080ti. Geforce experience says it should be on, but it becomes greyed out in game. Another thing no one ever mentioned...with ray tracing on, i get severe mouse lag. 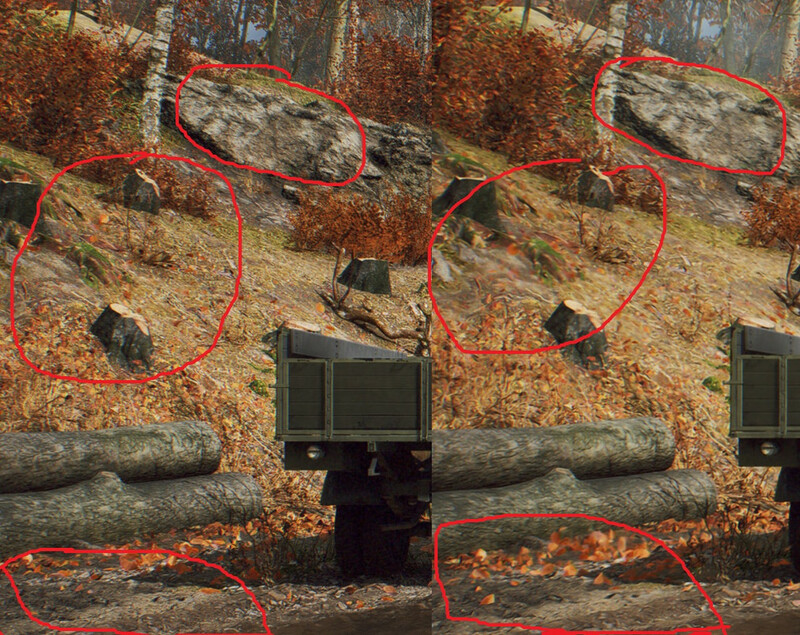 A comparison between DLSS on/DLSS off/75% resolution scaling at the same resolution/75% resolution scaling at the same resolution on a Radeon VII. I think that would make for a very interesting comparison. Blury mess, with missing detail, looks terrible. Btw, great work Hilbert, I like the sliders a lot, another toy to lose time with. The one thing I didn't really understand here is the difference in the comparative screen shots--the DLSS On shots show vegetation close up, while the DLSS Off screens put the vegetation in the far distance and obscured by fog. Scratching my head on that one...?